Why most small business marketing messages fall short—and what you can do about it. Small businesses are in crisis… a messaging crisis. They all think they sound different, yet in the eyes of potential customers it all sounds the same. It also shows up on websites and brochures…. Your source for basement repair! Lawn treatments at a great price! We provide a full range of chiropractic services! It’s the surest way to commoditize yourself. You are who your customers perceive you to be and, with this type of marketing message, you’re just selling the same thing as everyone else. WHAT DO YOU REALLY PROVIDE? In order to get above the fray and elevate your position in customers’ minds, you need to redefine your benefit and answer the question: What do you really provide? A benefit isn’t the product or service you sell, it’s the value a customer gets from their perspective… And you can’t win on vague modifiers like best quality or best service. The benefit needs to be specific and relevant. You’re not just an accountant, you save business owners time and money. You don’t provide lawn treatments, you make yards a place of pride and joy. You don’t provide chiropractic services, you promise pain relief and better mobility. Each of the above examples leads to a stronger marketing message that elevates your position and spells out real value to the customer. That value enables you to build a brand that stands apart from competition and commands a premium in your market. 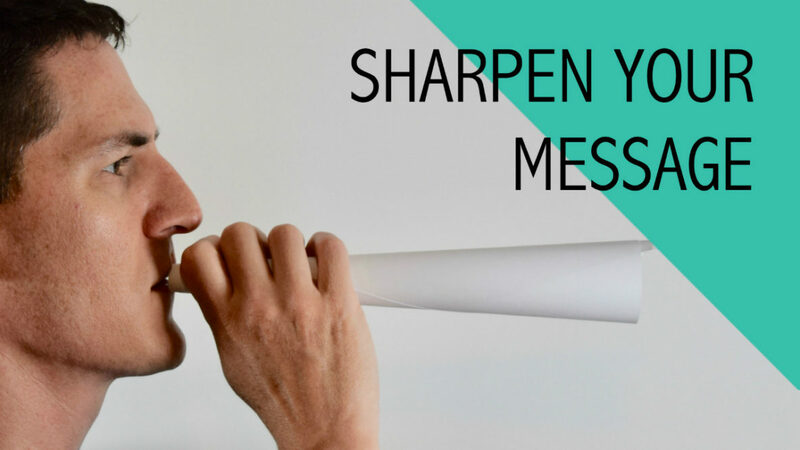 Here’s a fill-in-the-blank trick to quickly uncover stronger messaging that goes beyond the “thing” you sell. so that you [feel] _________. The first line usually prompts the most common functional answer. The second line usually prompts something the customer gets as a result that is of greater value. The third line usually prompts a higher order and/or emotional benefit. We carefully pack and transport each item in your home as it if were our own, so that you get everything back in place like it never left, so that you feel worry-free, peace of mind. See how that works? Now you have great language and ideas to use as a starting point in your communications. Try it out for your small business and start elevating your marketing message. Post what you come up with in the comments. Then don’t just communicate it, but also live up to it. Make it your mission to deliver your new promise each and every time. A clear marketing message is an integral part of a sound marketing strategy. If you’re struggling with clarity in your small business messaging, clarity in who you are targeting, or clarity in which tactics will work best for you, maybe we should talk. Click here to learn how you can get a clear, custom marketing strategy in just 30 days or less. If you found this article helpful, use the buttons at the top of the page to share this post. You can also subscribe to receive marketing strategy tips and updates. Levels of awareness include unaware, problem aware, solution aware, product aware and most aware. If a potential customer is “problem aware” it means they have experienced a pain/problem and are actively seeking a solution. This is important as it affects how you communicate your ad message to them.